It’s a fine line between genius and madness. Legitimate works of awe have been the result of an inflated sense of self worth. Some of the greatest works of human ingenuity and skill have been the results of delusion and audacity. Enter the Castles of Mad King Ludwig: picturesque castles created at the whim of a madman, and you’re in charge of building them. Can you build the castle that best pleases the king and claim the title of master builder? Or will you disappoint the lord of the land and be put to shame? Rooms must be placed so that at least one of its doorways connects to a doorway of a room already in the castle and so that a path can be traced from that room to the starting castle foyer. That is, a room cannot be placed so that entry to that room is impossible. Every room awards points when placed and most rooms will award points when placed adjacent specific types of rooms. The Servant’s Quarters, for example, awards 2 points for every corridor that it is connected to. Additionally, whenever all the doorways in a room are connected to other doorways you are awarded a completion bonus. The bonus you receive depends on the room you’ve completed and range from earning an extra turn to receiving 5 extra points. Play continues until there are no more rooms to be constructed and further points are awarded based on the public and secret objectives. The actual castles of King Ludwig are breathtaking works of architecture set against a Bavarian backdrop of nature at its most beautiful. They are the quintessential castles, so much so that the castle in Disneyland is actually modelled after one of them. The box cover of Castles of Mad King Ludwig depicts a towering castle amidst a lush pine forest bordering the snow capped peaks of southeast Germany. However, open the box and it’s a different story. The main boards are drab grey with a repeating brick texture that looks like it came straight out of MS Paint. The same muted motif is carried through to the room cards and the borders of the rooms themselves. The center of the rooms are adequately illustrated, but lack any life or vibrancy. You’re supposed to be building a palace fit for a king, not kitchens with yellow, checkered linoleum flooring. The art of Castles of Mad King Ludwig does nothing to convince you that you are constructing an architectural masterpiece. Perhaps most disappointing is the fact that there is a real world example this art done well. The Polish version of Castles of Mad King Ludwig is gorgeous (https://cf.geekdo-images.com/images/pic2315023.jpg). There is a level of detail that lends heft to the grand work you are striving towards. There’s a warmth to it that is welcoming and inviting. But apart from the art design, the actual physical pieces leave much to be desired as well. The room tiles are small and thin. The coins are even smaller and chintzy. It feels barely a few steps above a high school art class project, and it robs the game of the gravitas it deserves. “But what matters is how a game plays, not how it looks!” many will decry. There is some validity to the argument. No amount of artistry and physical presence will save a dreadful gaming experience. But it isn’t an all or nothing proposition; there are great games that look the part, and you can find games that dazzle the mind as much as the eyes. Board game designers are quickly realizing that a large part of board gaming is the physical dimension. These are objects that we touch and manipulate. They sit on your shelves and are splayed across your tables. They exist in the actual space, and they should look like they deserve to be there. There’s more to the package than rules and systems; being simply good isn’t good enough anymore. Luckily, Castles of Mad King Ludwig is great. The central concept of the game is solid. Assembling an assortment of rooms to construct some semblance of a working castle is just fun. It appeals to the same base desire to create as blocks and Lego bricks. It’s satisfying to watch a single room sprawl across the table, knowing that every nook and passageway is the direct result of your decisions. The randomness of the room tiles rarely leads to castles that reflect anything resembling rational planning, but rather than becoming a hindrance to the believability of your actions, it works itself beautifully into the theme. Of course your castle doesn’t make sense; you’re trying the please the mad king! We add the insanity by ending our plays with tours of our freshly built castles, struggling to justify the oddities that have arisen. 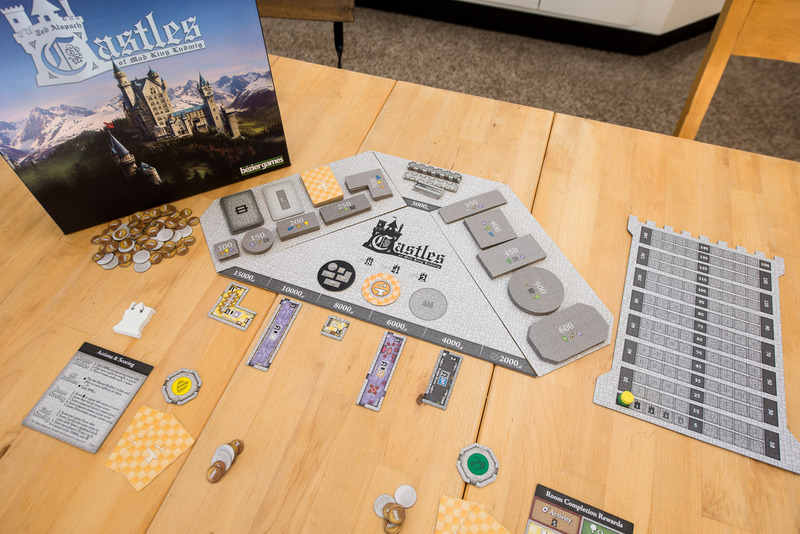 But if Castles of Mad King Ludwig were just a simple a tile laying game, it would struggle to stand out amongst the crowd. What elevates it above its peers and worthy of your attention is the Master Builder. Every time it’s your turn to be the Master Builder you’re faced with tense and meaningful decisions. Setting the prices for the available rooms not only dictates what your opponents will be paying for them, but it’s also the basis for your income. Set the price of a room too low and you’ll miss on potential income. Set the price too high and you’ll scare them off altogether. Your goal is to place a room at the highest a person is willing and able to spend on it. And since the price scale is predefined, you’re always at risk of placing a tile entirely too low or too high. Being the Master Builder forces you to examine every opponent’s castle, and to consider every player’s goals and strategies. You must enter the mind of your opponent if you aim to do well. 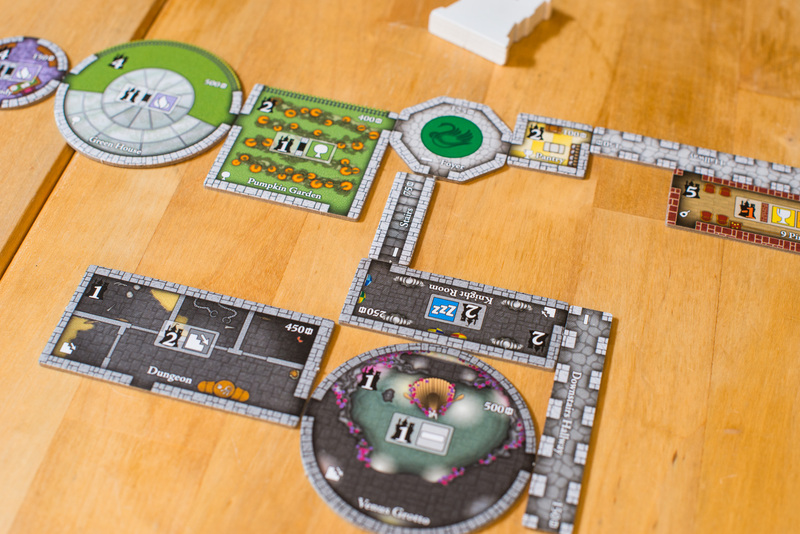 It’s a level of gamesmanship that takes Castles of Mad King Ludwig from the realm of also-rans to elite status. A board game can be exquisitely designed, but if it doesn’t take advantage of the fact that you are playing with actual people, it fails to take advantage of a valuable resource, the human element. The Master Builder keeps Castles of Mad King Ludwig from ever feeling mechanical. You’re not at the whim of a set of systems as much as you are the actions of your opponents. And then there’s the hidden goals. I love hidden goals. I love trying to figure out what other players are up to, and I love the direction they provide with your own strategy. And I love how easily they fit into the game flow. They work incredibly well in concert with the Master Builder role that Castles of Mad King Ludwig employs. In a game where points are doled out like candy, it alleviates the feeling that it doesn’t matter what you do because you’ll get points for anything anyways. The goals filter your decisions ever so slightly into certain directions so you still get the freedom that many “point salad” games enjoy, but avoid the feeling that no matter what you do it’s all the same. 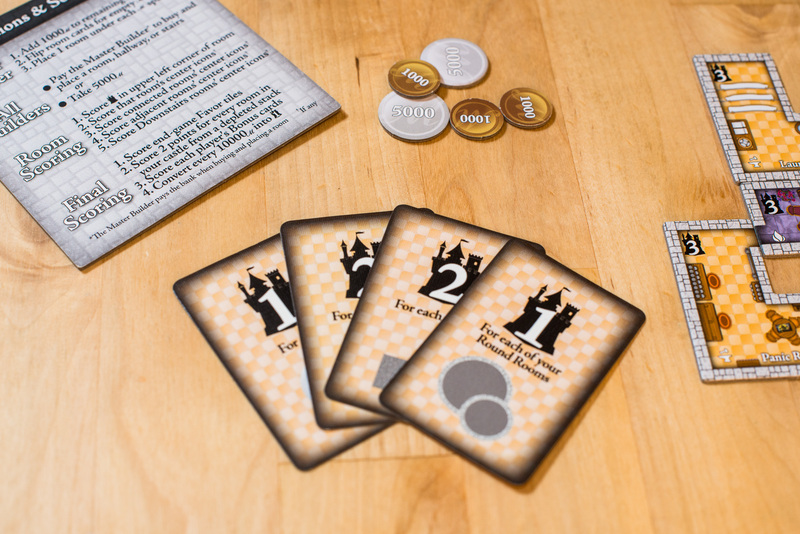 Castles of Mad King Ludwig manages to overcome its lackluster presentation with smartly designed systems and constant player engagement. There’s a higher amount of randomness in lower player count games, but it’s a minor quibble. The game combines the satisfaction that comes from creating and constructing with the gamesmanship of reading your opponents. Your decisions are meaningful and ripple throughout the game. Money is tight; every coin spent is a coin given. Yet every room built is a step towards victory. And every game played is a fun time.